*Roman will show you his favorite Fischer games these games are Fantastic and rarely analyze. *Roman comments on Fischer vs Karpov and who was better Fischer or Kasparov? *Bonus included Interview from Karpov on Fischer and he annotates Game 3 of 1972 W.C. In the early eighties Fischer requested to meet and play Roman they played series of 3 and 5 minute games where Roman held and edge in the 3 minute games and Fischer held an edge in the 5 minute games. According to Roman he was at the peek of his game and Fischer was 9 years removed from the World Championship so not to put much creedance in the biltz match. According to Fischers agent Bobby had requested to play a match against Roman she advised against it because Roman was too strong and recommended a young Annad however the match never came to be. I asked Roman what would have happen if you played Fischer in his prime and he said he would of lost. 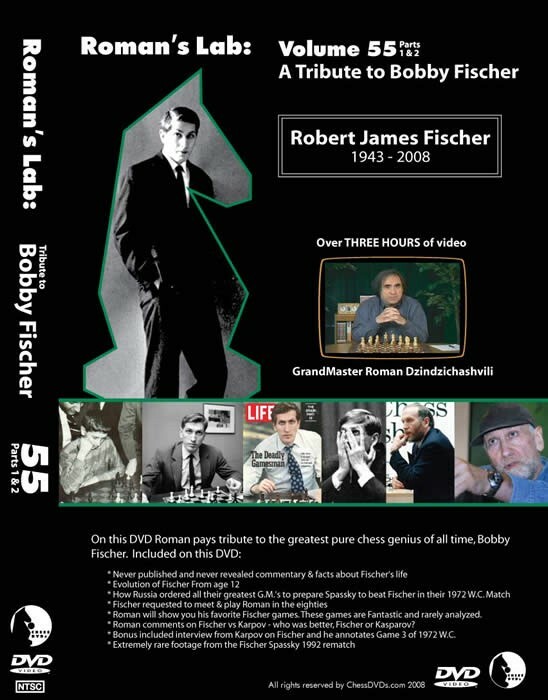 On This dvd Roman pays Tribute to the Greatest pure Chess genius of all time Bobby Fischer included on this dvd *Never published and never revealed commentary & facts about Fischers life *Evolution of Fischer From age 12 *How Russia ordered all there greatest G.M. 's to prepare Spassky to Beat Fischer in there 1972 Wc Match *Fischer requested to meet & play Roman in the eighties *Roman will show you his favorite Fischer games these games are Fantastic and rarely analyze. *Roman comments on Fischer vs Karpov and who was better Fischer or Kasparov? *Bonus included Interview from Karpov on Fischer and he annotates Game 3 of 1972 W.C. *Extremely Rare footage from the Fischer Spassky 1992 rematch This DVD Susan will teach you an exciting In the early eighties Fischer requested to meet and play Roman they played series of 3 and 5 minute games where Roman held and edge in the 3 minute games and Fischer held an edge in the 5 minute games. According to Roman he was at the peek of his game and Fischer was 9 years removed from the World Championship so not to put much creedance in the biltz match. According to Fischers agent Bobby had requested to play a match against Roman she advised against it because Roman was too strong and recommended a young Annad however the match never came to be. I asked Roman what would have happen if you played Fischer in his prime and he said he would of lost.